I know some people roll their eyes at the thought of how much time you must have in order to “waste” some making baby food. However, I have found it to be the total opposite. If I take about 2 hours, I can make enough food to last me a month! Now that Chunky Monkey is 1, I am making squeeze packets and freezing quick vegetable snacks, but I have been making his food since he started solids (at 6 months). *I’ll post some baby food ideas soon. 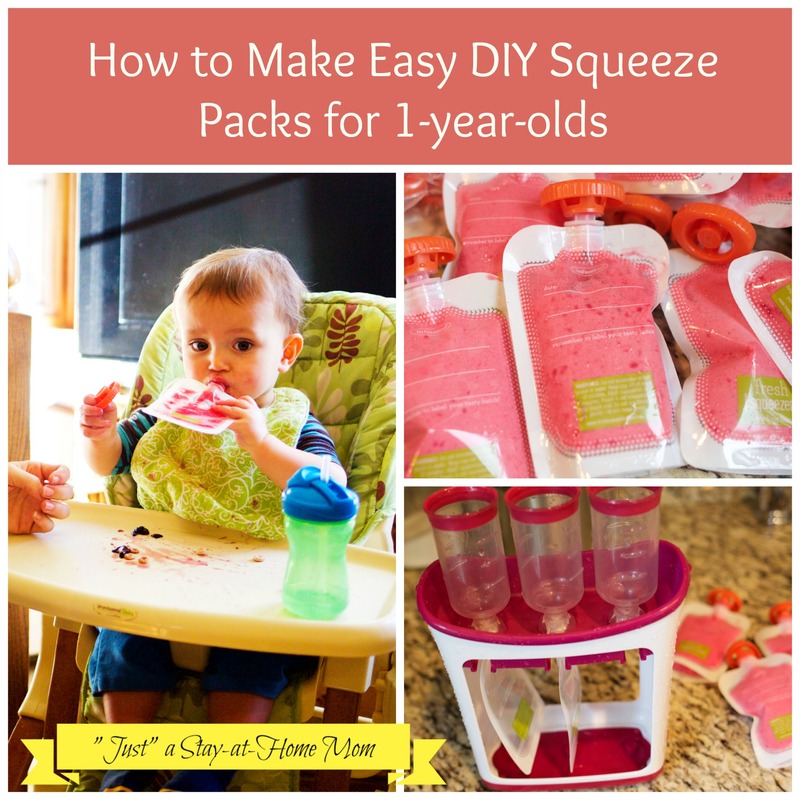 Here is a quick and easy way to make DIY healthy squeeze packs for your 1-year old. 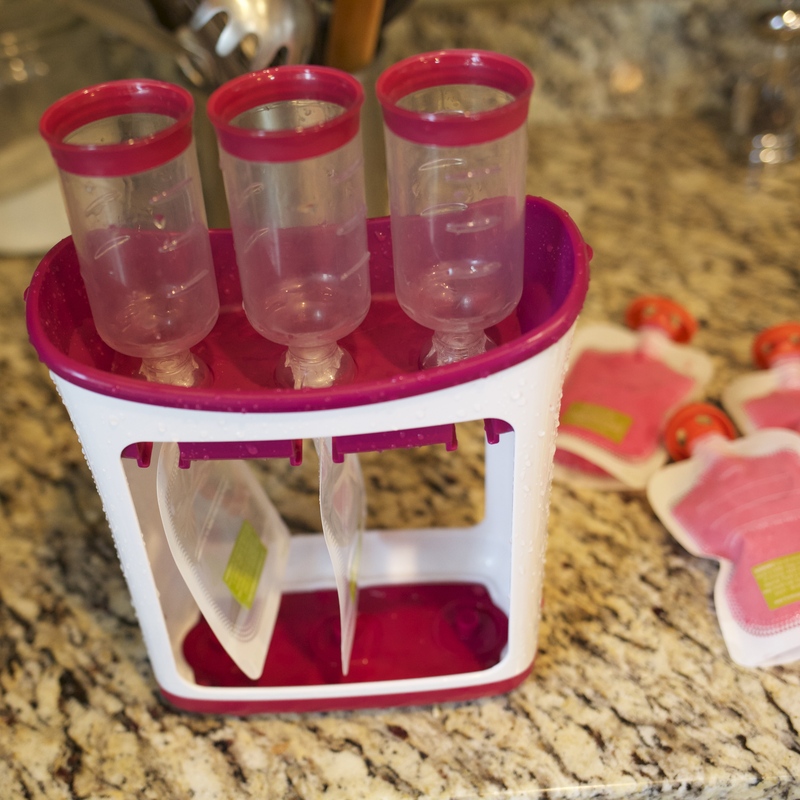 These are squeeze packs (using the Infantino Fresh Squeezed system). 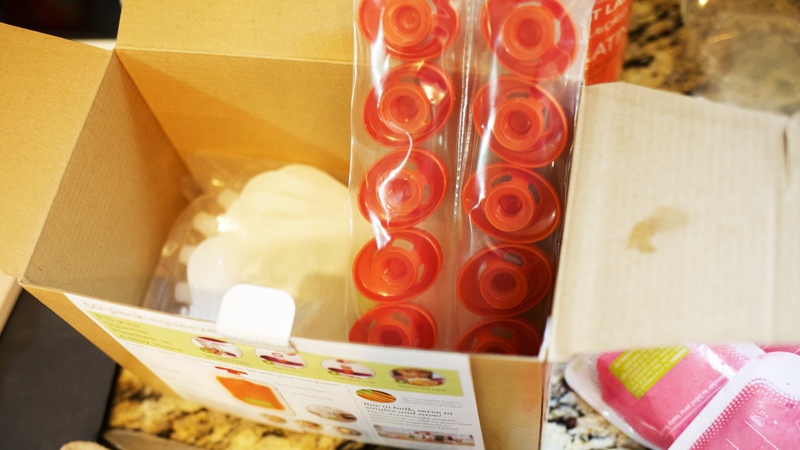 Half of the cost is the Fresh Squeezed “station” which you reuse every time you make the squeeze packets. Total worth the $16 cost! *And actually a friend of mine has been lending me hers. So find a friend to share with and you’ve just scored an even better bargain! It’s then $13 for 50 DIY squeeze packs (Prices are from 2/2015 on Amazon). That’s less than half the price that you pay for pre-made packs. Plus, you get to control what ingredients are in the packs (organic, gluten-free…whatever your pleasure). My son is loving fruit smoothies right now, so pre-making squeeze packs means I only have to get my blender dirty once a month, too. yeah! 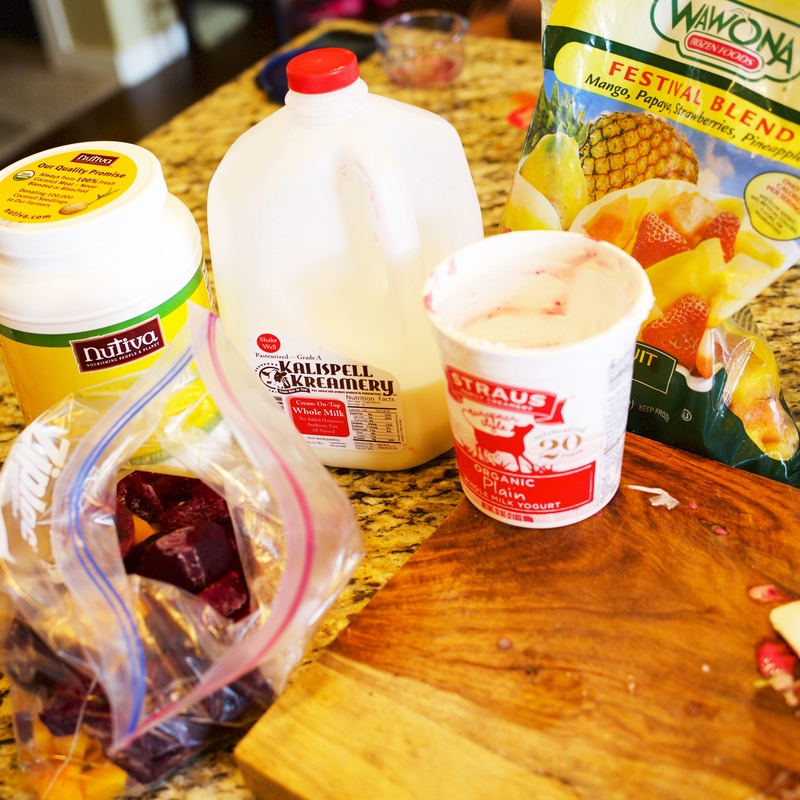 Smoothie: Whole milk, Greek Yogurt, Frozen fruit, coconut oil (to help digestion), and I sneak in some cooked beets. 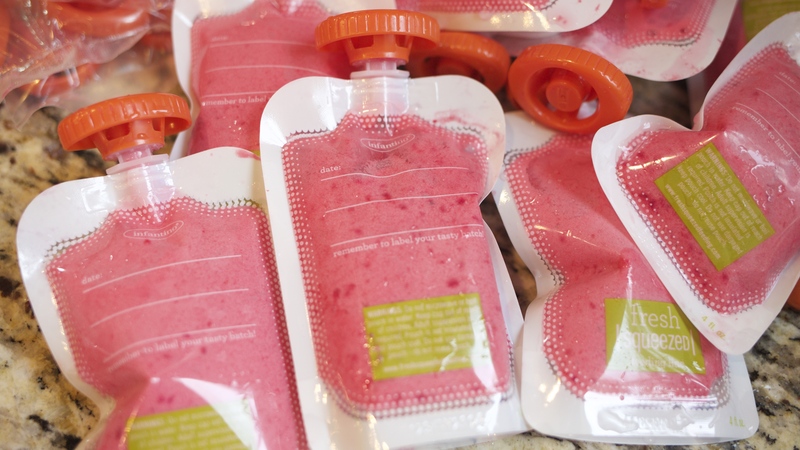 *I’d love some more ideas, so please post recipes you have used for your squeeze packs in the comments below! They can be frozen for a few months and easily thaw by taking them out a day before you plan to eat them, or putting them in a mug of warm water (the same way you warm up a bottle). I really love these DIY squeeze pouches. I have never seen these. Mommy in Holland shared this post on her DIY baby food recipes. I’ve scheduled this on my Facebook page for 3/17. Fabulous! I really love them! They are great. Now that my son is 2 1/2 we have actually sort of regressed to ice cube trays. Here is why – He now doesn’t want squeezes, but still loves fruit smoothies. They are a great way for me to get some veggies, ground up flax seed and probiotic into his diet, so I love them too. Rather than make smoothie pouches, I now make up large batches and freeze them in ice cube trays (like I did for his baby food), and then each morning I just defrost about 5 cubes and put them in a cup with a lid and large straw. He loves it! Making healthy, affordable foods easy to serve is a great idea! 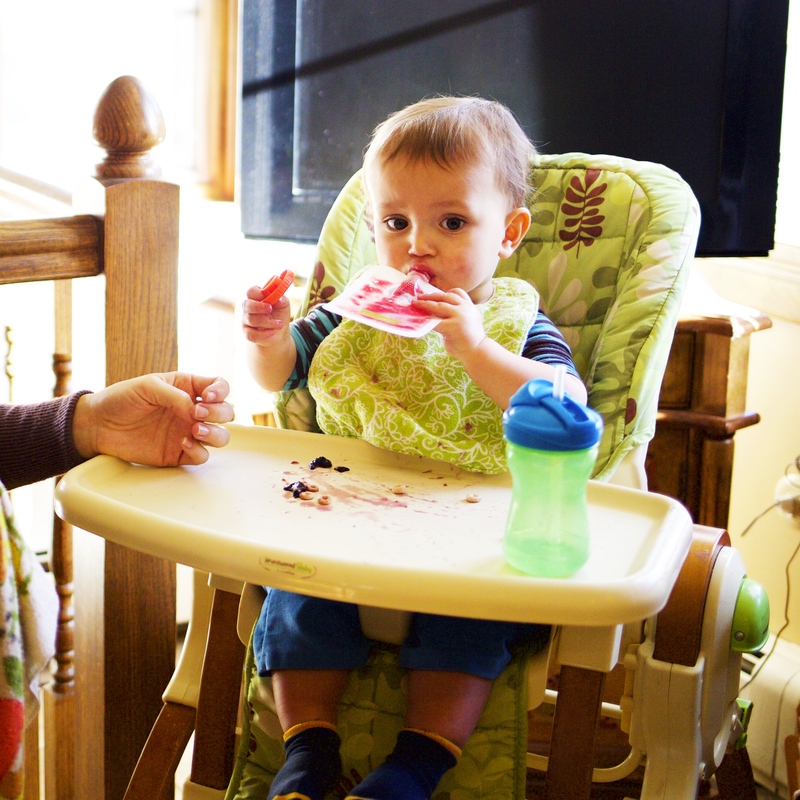 You could be spending even less time on it, though, if you just serve your baby some of what you’re eating yourself. My son liked purees, and we made most of them using a hand-powered grinder which is much easier than it sounds. My daughter, who’s now 10 months old, likes to feed herself chunks of soft food, so that’s even easier. 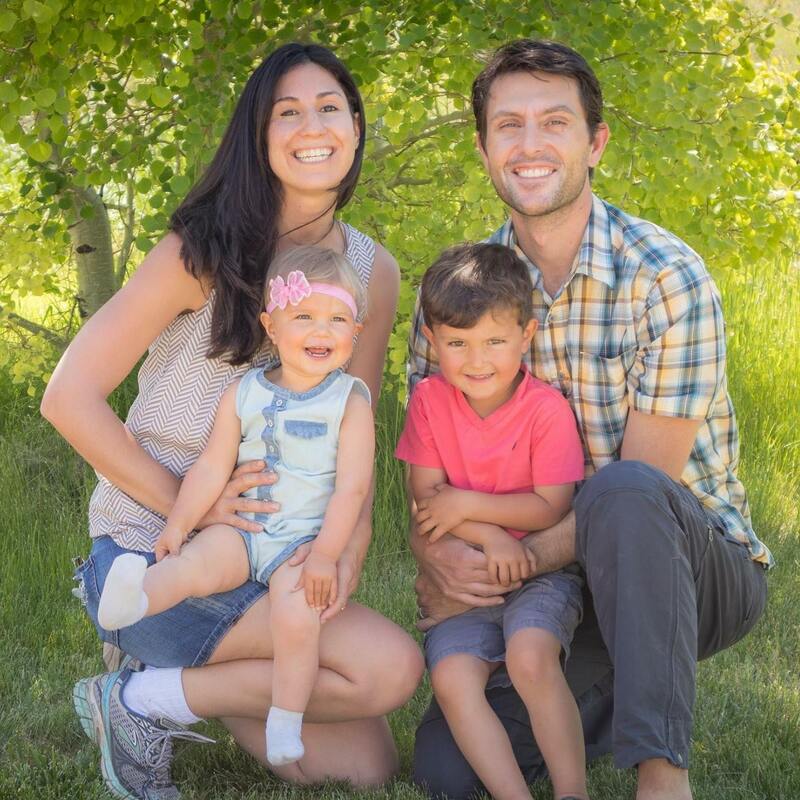 Here’s how we have shared some meals with our baby–that might give you ideas for new foods for your son, however you serve them. For families that really like pouches, another option that saves money and the environment is Squooshi reusable pouches. I was skeptical, but they really are easy to clean! They open up for filling, so you don’t have to get everything through the tiny spout. And they are super cute! You’ve inspired me Flora. I have made all of Norah’s food so far but just in baby food ice cube trays. She likes feeding herself though so I have done some “baby led weaning” with things like beans, sweet potato, carrots and yellow squash. So! Hopefully she will like eating out of squeeze packets too since she can feed herself that way too.